Vyacheslav Stoyanov had dreamed of visiting America since he was a young child. Yana Melamed grew up visiting family in the United States. But she long dreamed of exploring South America. Together, they are making both of their dreams come true. Yana is from Bulgaria. Vyacheslav, who goes by Slav, is originally from Ukraine. He moved to Bulgaria almost 20 years ago. 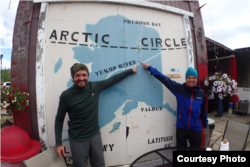 Last June, Slav and Yana flew on an airplane – with their bicycles -- from Sofia, Bulgaria, to Deadhorse, Alaska. The town of 25 people is one of the northernmost communities in North America. 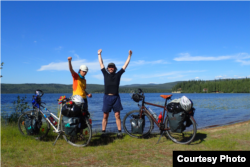 From Deadhorse, they began a 60,000-kilometer bike trip, from Alaska to Argentina. They are biking to the southernmost point in South America. “The life on two wheels, it’s something very, very exciting, and very fun actually,” Yana said. “Most of the people think it’s very hard, very tough, cycling all day with the luggage. Yes, we have the tough times. But it’s a lot of fun because we are very independent." But their journey is not only about having fun and fulfilling their dreams. 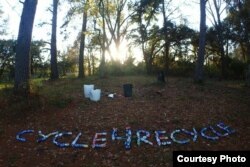 Yana and Slav call their mission Cycle4Recycle. They say the goal of Cycle4Recycle is to make people more aware of how to protect the environment and preserve natural resources. “We are not usual tourists, who are looking for landmarks." Slav and Yana call themselves researchers and explorers. Along their trip, Slav and Yana give presentations at community centers and museums. Their presentation centers on their research into recycling and consumerism in the Americas. Even the world-famous Field Museum in Chicago invited them to give a presentation on their research. They always clear away trash in the park before they set up their tent and cook a meal. Sometimes, they find use for the trash they find. The Bulgarian flag that waves on the back of Yana’s bike, for example, was sewn together from pieces of fabric they found along the road. And Slav still uses a water bottle he found in Canada. “Recycling is the most important point. Because everything (is) building from oil at this moment. We want to involve people to reuse the packages, like the bottles." Even their bicycles are recycled. Yana’s bike is over 35 years old. “So, this is my bike, Villiger Trulix. And Villiger is more than 30 years old. And he's a Swiss bicycle. He's made in a time when everything was meant to last forever. That's why I'm very happy that he decided to join me in my trip." Slav calls his bicycle “Konya,” which means “horse” in Bulgarian. They bought both used bicycles for less than $200. In December, Slav and Yana arrived in Washington, D.C. 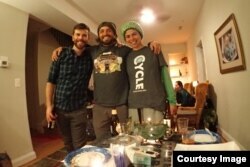 They had been biking for more than 10,000 kilometers. If the weather is too cold or wet for camping -- or if they just wish to sleep in a real bed -- Slav and Yana log on to WarmShowers.org. The website connects local hosts with cyclists who are on long journeys. Warm Showers is similar to Couchsurfing, but it is especially for bicyclists. The website has more than 27,000 hosts around the world. In Washington, D.C., Slav and Yana spent three days staying with Scott Macdonell, a Warm Showers host. Macdonell says he was happy to help the two bikers out. In exchange for a free place to stay, Yana and Slav like to share homemade meals of pasta, dumplings and bread with their hosts. Yana says she and Slav learned how to make bread and pasta while biking in Alaska and Canada. “When we were up in the north, the distances between supermarkets was like 2,000 miles. We cannot carry bread or stuff. We can only carry dry food, and we have to cook it. We were forced to learn how to make bread. And now we just can’t stop doing it." From Washington, Slav and Yana will continue their journey south toward Florida. They will travel along the East Coast Greenway. The greenway is a trail system that connects major cities in the eastern United States, from Maine to Florida. After Florida, they will head west, through the southern states of Georgia, Alabama, Mississippi, and Louisiana. Then, they will cross Texas, New Mexico, Arizona, and California, following the historic U.S. Route 66. They plan to cross into Mexico from California. 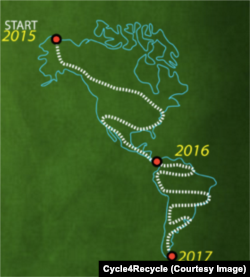 After that, they plan on biking through almost every country in Central and South America, on their way to Argentina. “A cycling journey ... it's very nice to explore the cities and explore the nationalities and the countries because you go slow. You can see much more. You can stop everywhere. If you look at a beautiful place, you just stop. And you can enjoy. And it's like a luggage. You can even bring your bike in the plane." Ashley Thompson wrote this report for VOA Learning English. Caty Weaver was the editor.